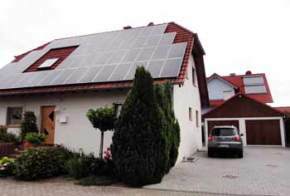 Solar power for homes is no longer new and is becoming not only possible but highly desirable. Other green energy options are also becoming more common. As climate change becomes an ever-present reality, some governments are doing more to promote domestic solar power. This section of Greenfootsteps.com looks at solar power and other renewable energy options, such as wind energy, for the domestic market. There are also some more general articles on green energy at the bottom of the page. Read on below for more details on solar power. Solar power - a realistic option? There are a good many options to consider and the market is changing fast. Solar power does still represent a considerable investment for most people. There are many packages available that make some kinds of solar power a realistic option for families living in ordinary homes. The truth is that many of these packages are far from cheap and the payback times may be long. Fortunately, there are government grants available in many countries. The beauty of solar power is that the energy source itself is free. We all benefit from solar power every day whenever we eat because converting sunlight into stored energy is what every plant and animal does as its birthright. And no-one pays to make the sun shine! But solar power for homes as a source of heat or electrical energy is still relatively new and the equipment you need to access solar power in your home is certainly not free. The start-up costs can be high (for photovoltaics, for example) and it may be many years before you can count your investment as fully returned to you as endless free energy. Not all systems are maintenance-free, either, so this is another aspect which needs to be factored into your decision on what to buy. Solar power for RVs, caravans and boats may be a practical step for people who would, perhaps, not yet consider it for their main home where the power of the grid is readily available. You can see examples of what's available here at Amazon. In this section of Greenfootsteps.com we explore solar options and other alternative energy sources to try to clarify what is worth doing and what is not. There are a lot of fast-buck outfits jumping on the solar bandwagon, so it's good to know a little about what you are buying into. I hope these articles on solar power and other green energy ideas may help a little. Cheap solar power This page outlines some of the benefits of solar water heating systems and describes how they operate. DIY solar power for hot water is a round-up of some of the approaches to home made solar power systems. The best solar ovens for home use A solar cooker can be a practical and cost-effective way of cooking food for some people - read here about the different types. The advantages of renewable energy contains a brief look at some of the main advantages and disadvantages of renewable energy options. Here are two pages about initiatives within the European Union. The first is about promoting eco-innovations and business ideas which help with energy efficiency and/or climate change objectives. The second one is mainly about promoting green energy solutions in the EU. Despite the straitened financial times, the EU still has funds to help green start ups and new business ideas! Offshore wind power offers renewable energy for the future - a look at innovations which make offshore wind power more sustainable and cost-effective. Picture link, above: make your own detergent.